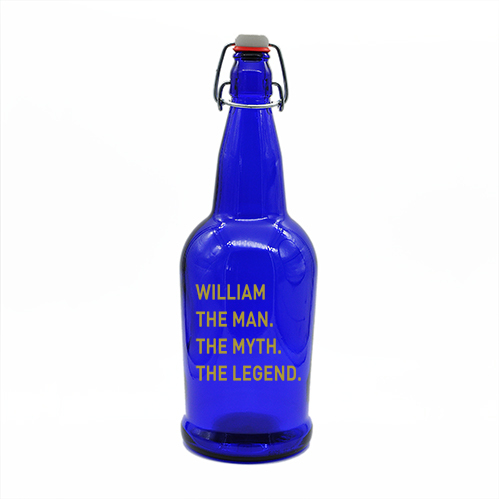 Let the legend live on when you personalize your blue growler with your name, The Man, The Myth, The Legend right on the bottle. Perfect for hand crafted beer and wine. Your hand crafted brew is what legends are made of and you have the ego to go along with it. Leave your mark on the outside of this 1 liter cobalt blue growler as you will leave your mark with what you put inside. Customized with your name, you are The Man, The Myth, The Legend. Choose from an etched look or color fill in red, white or gold. Growler comes with a swivel top lid to keep that legendary brew fresh longer. Order yours today!